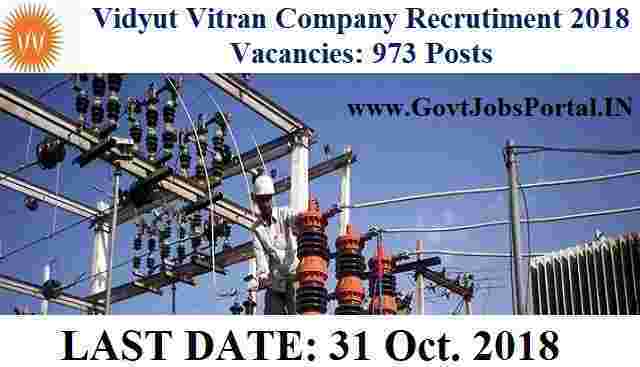 Vidyut Vitran Company Limited is looking to recruit fresher candidates for Trade Apprentice posts in MP State. Those who are looking for the Government jobs in MP state can apply for this recruitment process 2018. 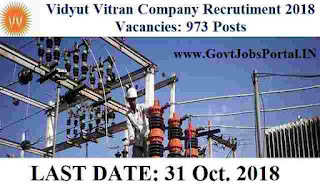 There are total 973 vacant positions which are going to be filling up through this Vidyut Vitran Company recruitment process. We took this information from the official PDF file which was shared by the department on their official website. That PDF file is in HINDI language and here we translate that in English language. So those who understand written Hindi can check out that PDF file also and those who don't please read the whole article carefully. More information related to these MP Govt Jobs is given below in this post. We request you all reader to read the information carefully till the end before moving to apply online for these Government jobs. Pay Band: Rs.8232 per Month. Educational Qualification: Those who have passed in their 10th class and after that completed their ITI course in the respective trade can apply for these Government jobs in MP state. All Fresher ITI pass Out candidates are eligible to apply. Age Bond: Applicants age must be in between 18 years to 25 years for applying. Applicants can apply for this recruitment process online without paying any application fee. Department is offering ZERO application fee for applying. So if you are eligible and want to garb a job without paying any application fee than this is the best opportunity to grab a Government job. The Link for applying these latest Govt jobs is live now. So those who full filled all the eligibility criteria can apply online through he official website. We shared the link under IMPORTANT LINK section for applying these MP Government jobs. The Link will be remain active up to 31stOct. 2018. So all eligible candidates have to apply online before this date. 31ST Oct. 2018 is the Last Date to apply.